In the early ’90s, when Garth Brooks emerged as the leading light amongst a new generation of country artists, his clear affection for rock histrionics, arena spectacle, gritty guitars, and genre-stretching rhythm section oomph made him a maverick. Today, it simply makes him par for the country course. With his first album in 13 years, “Man Against Machine,” limping along, relatively speaking, in terms of early sales, Brooks finds himself competing within a landscape he pretty much created himself. And he doesn’t seem to be faring too well. If guys like Jason Aldean came along and dumbed-down the Garth “country-as-rock” template and in the process crafted the atrocity that is “Bro Country,” they also managed to make Brooks seem redundant. “Man Against Machine” doesn’t do much to battle such an assertion. It’s sturdy, well-played, and happily, not particularly over-produced. It also can’t help but seem totally unnecessary. Brooks primary playing cards have always been earnestness, conviction, an everyman persona that threatened absolutely no one, and allowed the man to simultaneously sneak classic rock elements into the country mainstream and posit himself as an outsider. It was all smoke and mirrors, but Brooks had the tunes, the voice, and the long-expired membership in the Kiss Army to make it all work. “Man Against Machine” arrives naked and unassuming, though. 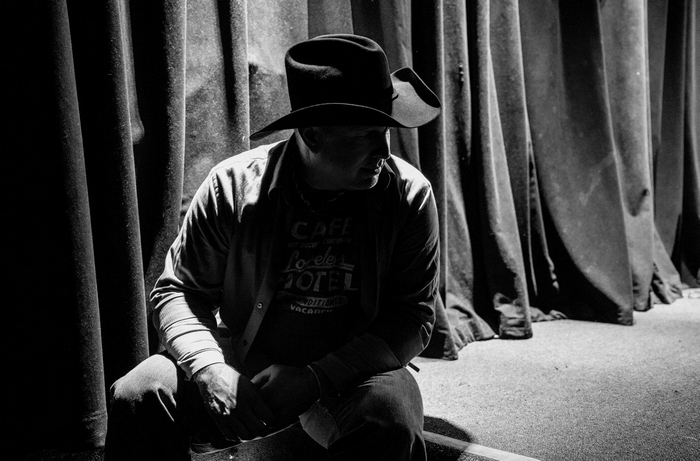 The contemporary country scene acknowledges Brooks’ influence – how could it possibly not? – but it doesn’t necessarily want or need him around any longer. Garth attempts to arrive like John Henry swinging his hammer on the album-opening title tune, but ends up coming across like an American Idol hopeful covering an Aerosmith tune. (And not a good Aerosmith tune, either – think ’90s Aerosmith, not ’70s.) “She’s Tired Of Boys” is a country-rock ballad with some deedley-deedley lead guitar woven in between the fiddles and acoustic guitars, and would’ve been a smash in 1996. “All-American Kid” finds Brooks employing his deeper register – he’s not exactly George Jones in that department, but even at 52, he still sounds convincing and engaged – in service of a tune that proves to be as cliché-ridden as its title would imply. And on it goes, with Brooks attempting to reclaim his throne based on the fact that he is a better singer, writer, performer and musician than the entire generation of “Bro Country” artists who rode the waves he created all the way to a platinum shore, arriving with abs glistening and Bud Light Lime in hand. The thing is, these qualities that made Brooks stand out back in the day are not attributes that mean what they once did. No one really cares anymore. They’d just as soon listen to Florida Georgoia Line. That said, Brooks will do mega business on the road this year, as he’s already made clear. Even if his new album proves to be of little interest to his fan base, which seems to be the case, those fans will flock to see the guy play all the old stuff in concert, and pay top dollar for the privilege. So welcome to the world of classic rock, Garth. Better not put too many new tunes in the set list. Stick to the hits, and nobody gets hurt.